When carrying out domestic or commercial construction and renovations there’s bound to be plenty of mess to clear up afterwards. From bricks and stone, to timber beams and guttering, this excess waste will have to be professionally taken away. And this is where cheap skip hire comes in. Skips come in a range of sizes depending on your needs and allows you to get rid of the debris without hassle. Once full, the skip hire company will collect and dispose of the waste. The same skip can be returned, or you may have more than one at your disposal. Skip hire is crucial for many constructions and offers a quick and easy way to remove rubble from the scene. You’ll be able to have the skip delivered as close to the site as possible, ensuring you don’t have to travel far to dispose of the waste. The cost of hiring a skip is very affordable, and comparing quotes from professional companies will ensure you get the best price on the market. Skips are reliable and can take plenty of waste depending on your individual needs. You could hire a smaller domestic skip or larger commercial skips to remove rubble. 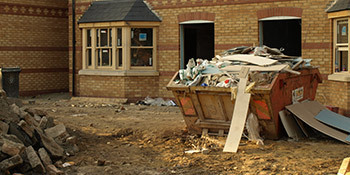 Skip hiring is important in the construction industry and whether you’re adding an extension to your home or building an entirely new property, you’ll need to have the waste removed. If you’re interested in receiving up to four FREE skip hire prices and quotes from local, vetted and reputable companies, simply complete our quick form and hear from the professionals. Project: 6 yard skip hire please. Many thanks. Project: 6 Yrd skip - removal of old kitchen. Project: mini skip £60 ? pay when you collect ? Project: I need to get rid of all the stuff I don't need anymore. Excellent customer service and skip delivery and collection very prompt. Just brilliant ! The below information displays the energy performance of houses in Uk. Energy ratings range from A to G, with A being the most energy efficient and G being the least efficient. The Energy Performance Certificate (EPC) rating comes into play heavily when attempting to sell your property, as prospective buyers will see just how much they're most likely to be spending on their heating bills. Property upgrades such as insulation help to drastically boost a home's EPC rating. There are many different types of property in Britain and the data below highlights the type of houses in Uk. Throughout the country the most popular housing types tend to be semi-detached and terraced housing, although detached homes, flats and bungalows are also available. The data underneath provides an indication for the number of properties in Uk that are central heated and non-central heated. Homes are heated by a range of sources which reflect how pricy annual energy bills will likely be. Types of central heating include gas, electricity, oil, solid fuel and LPG boilers. Changing the way in which your property is heated could see you with cheaper bills. The data below displays the spread of properties heated by different fuels. Around the United Kingdom the most common hands down are gas heated houses, followed by electricity and then oil. Biomass boilers are also rising in popularity, heated by sustainable products including wood pellets or agricultural waste.|Properties in Britain are heated by a range of fuels, including gas, electricity, oil, solid fuel and LPG boilers. Each fuel has a varying cost associated with it and that means you might find yourself with less expensive energy bills by altering the way your household is heated. Even solar thermal panels are being regarded as by many people as a way to cut heating bills for the years to come.